The Standard Schnauzer is known as the dog with the human brain and is the original of all 3 types of Schnauzer. The Schnauzer, as it is simply called in the UK - or ‘Mittelschnauzer’ in Germany - has been a celebrated European breed dating back to the 14th or 15th century. They originated in Southern Germany where they were bred for their versatility. This athletic dog kept the rats out of the barn, guarded the farmyard and traders’ wagons and herded livestock. During World War I, Standards were used as guard dogs by the German Army and dispatch carriers by the Red Cross. It wasn’t until after the War that they were first imported into America in any numbers. 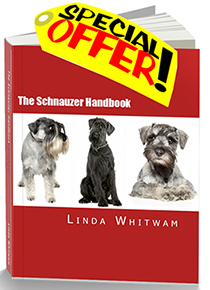 Read more about the fascinating history and naming of the Schnauzer. Despite being the original, the Standard is not as well known as its cousins the Miniature Schnauzer and Giant Schnauzer. The breed is only the 107th most popular in the USA, compared with the Miniature at number 11 and the Giant at 83. The Standard Schnauzer is a medium size dog. Males stand about 18 to 20 inches high at the shoulders with the females being about an inch smaller. They weigh from 30 to 50 pounds. This is a robust and sinewy breed with a stylish appearance when groomed. He has the classic 'boxy' shape of the Schnauzer with the height at the shoulders being almost the same as the length of the body. Like all Schnauzers, the Standard also has the trademark full beard and bushy eyebrows. The amount of facial hair varies from dog to dog. Don't be disappointed if your Schnauzer puppy doesn't grow a full beard right away. Like men, they have to reach maturity before they can grow a bushy beard! 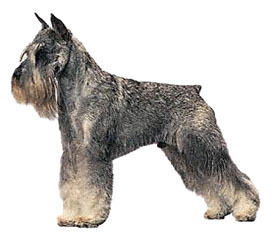 The Standard, like the Giant and Miniature Schnauzer, has a double coat. The outer coat is harsh and wiry and covers a softer layer underneath. You should brush your dog at home at least once a week and send him to the groomer's to be stripped or clipped about every 8 to 10 weeks, depending on how fast his hair grows. and so more suitable for people with allergies. While the breed is universally known for its athletic, square appearance and bearded face, the specific breed characteristics vary from country to country. 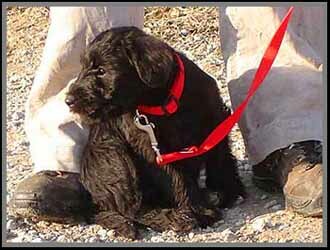 In the USA and Canada, the Standard Schnauzer is classed in the Working Group. In the UK the dog is shown in the Utility Group. In North America it is common to have both the ears and tail cropped. For showing the dog must have a docked tail and can have either cropped or natural ears. Since April 2007 in the UK it has been illegal to dock any dog’s tail - except for working gundogs. Dogs born prior to that with docked tails are accepted in the show ring. It is also illegal to crop the dog’s ears in the UK. In continental Europe, most Standard Schnauzers are left natural with long tails and floppy ears. 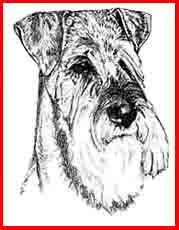 The Standard Schnauzer is an exciting dog to see and own. The clean, sharp lines of the breed are impressive. the dog with the human brain. It also means that if not properly trained by his owner, he can occasionally become a handful. However, with the right education, the Standard is a joy to live with. He is a true “people dog” and thrives on the stimulation derived from living with a family. Schnauzers are not generally one-man dogs. They may have a favorite person, but will readily accept all family members. They are noted for guarding the family home and displaying devotion to their immediate circle. This is not a breed for those who want a placid, friendly-to-everyone dog that can be fed, walked and forgotten. They like to be involved. Raised and trained properly, they are very good with their own family children and most others who respect their high sense of self-dignity. They generally don't like being teased. Like its Miniature Schnauzer cousin, the Standard likes to be at the centre of things. He develops to his fullest potential when treated as part of the family. For this reason most Standard Schnauzers - even the top show dogs - are house pets. The Standard is a strong dog capable of great endurance. Although the Kennel Club in the UK lists the breed as needing only moderate exercise, you’d be well advised to be prepared to do a fair amount of walking if you decide to become an owner! Just like humans, energy levels will vary from one individual to another. You do get the occasional couch potato Standard Schnauzer.....but generally the dog will require exercising two or three times a day. If you’re lucky enough to have a large garden, that's a bonus. However, in the canine mind there is no replacement for a brisk daily walk (or two or three...)to enjoy new surroundings and smells! Regular exercise keeps your dog's heart fit, muscles working and joints functioning. It also helps to keep your dog healthy and free from illness. As a general rule of thumb, a minimum of 45 minutes exercise per day outside the home is recommended. An hour or longer is even better. If you're thinking of getting a Standard Schnauzer puppy, proper training is important. A well-trained dog that you can take anywhere without worrying is a marvelous companion. Due to their intelligence, Standard Schnauzers do learn quickly. They will retain most things they learn – even the bad things sometimes. They therefore need direction that is consistent and firm, but never rough. Don’t be surprised if your dog tries to push the boundaries. He’ll rule the house if you let him! It's important for you to start off on the right foot with your dog. This means proper training. However you decide to train your Standard, it will be time (and maybe money) well spent. Putting in the effort at the beginning will bring rewards in the long run. A firm hand from puppy to adulthood is required and then you’ll have an obedient best friend and guardian for the rest of his life. Standards can excel in obedience, agility and herding, bringing both enthusiasm and intelligence to their tasks. 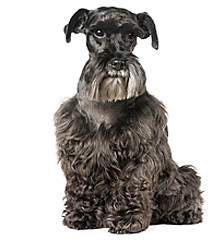 As a medium sized all-around performance dog, the Standard Schnauzer is hard to beat.